Designed by David Graas the ‘Not A Lamp’ and ‘Not A Box’ lights take the IKEA idea of flat-packed furniture and apply it to lighting instead. 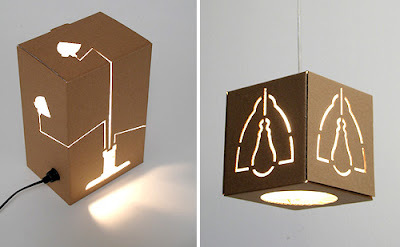 The ‘Not A Lamp’ is designed to sit on a table and has the silhouette of a lamp cut into a simple cardboard box, while the ‘Not A Box’ is designed to hang from the ceiling and uses the outline of a light bulb with a simple shade instead. As we all know that table light is a necessary decoration part in our lives. Reading can be one of the most relaxing activities that one can indulge in, whether it’s the newspaper, a novel or just any book that you can pick up. It is one solo moment when you shut the doors to everything else in the world and just flop down with something that can bring in lots of introspection. While I like the negative image effect of both lights I suspect the ‘Not A Box’ is a bit more useful since it has a large hole on the bottom that allows the light from the bulb to shine down onto a table. The intricate pattern of the ‘Not A Lamp’ on the other hand looks like it gives off very little light. So in this case I guess form just edges out functionality. And from what I can tell both lights come with ‘some assembly required’ not to mention supplying your own bulb, but I can’t imagine the instructions for putting it together are that hard to follow. The ‘Not A Lamp’ also comes in your choice of brown, orange, green or blue colors. Interior lighting often defines the quality of a commercial environment. Office space very often depends on the quality of interior lighting to create an ergonomic and motivated workspace that will contribute to higher production and profit margins. Everything from morale to corporate culture can be affected by a change in the interior lighting. Commercial production facilities rely upon interior lighting directly for manufacturing and shipping. In their world, proper levels of glare free illumination are a must for safe and efficient process flow. Some environments, such as manufacturing and assembly, rely so heavily on commercial interior lighting that their very survival depends upon its quality.